13. Liability is arisen from which of the following events.? 14. Cash budget excludes the following.? 15. Partners in Pakistan can today be fixed at the following numbers.? 16. Keeping the log of financial information in books of original entries is called.? 17. Liabilities are which of the following.? 18. Depreciation in spirit is similar to.? 19. Identify the nominal account.? 20. Sales budget must be prepared.? Thank you for this valuable information, I wish I can use it for my own knowledge. Although Every Comment is Appreciated. Feedback, Suggestions, Any Question Comment Below Be Carefully & Feel Free. Admin Will Give You Answer of Your Question in Just Within 12 Hours. Saad Ahmad Waqas. Powered by Blogger. 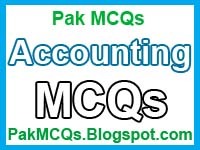 Copyright © 2016 Pak MCQs.